The law firm Carlson Lynch Sweet Kilpela and Carpenter requests your assistance in the legal effort to compel Steak ‘N Shake to comply with the Americans with Disabilities Act (ADA). According to their request, Steak ‘N Shake has systematically failed to comply with the ADA in its parking lots and a lawsuit was filed to obtain a court order that would require Steak ‘N Shake to remediate and maintain its parking facilities so that people with disabilities are able to access Steak N’ Shake restaurants without difficulty. This week, multiple news outlets reported that the Trump Administration is considering narrowly defining gender as a biological, immutable condition determined by genitalia at birth, which will eliminate the rights of Transgender people. The plan from the Department of Health and Human Services (DHHS) urges key government agencies to ignore modern science, medicine, and the law. This is a direct attack on the civil and human rights of millions of Americans in the Transgender and gender non-conforming community. The National Council on Independent Living (NCIL) is committed to using an intersectional outreach in its policy work. This encompasses a deliberate and genuine fight for the fundamental rights of our members, which include members of the Trans community. It is well known that Transgender individuals have full rights and protections established years ago through multiple courts. This Administration has continuously tried to dismantle the rights of many in this country and this is another attack that we will not tolerate. A reversal of the civil rights of this community will do nothing but cause more harm and produce poorer health outcomes. We believe that Trans people have the right to live safely in the community, have self-determination, and be included in every aspect of life. NCIL demands that the Administration reverse this direct and biased attack on the Transgender and gender non-conforming community. We stand with the broad coalition of civil and human rights organizations opposing and pushing back against these plans. The National Council on Independent Living (NCIL) is the longest-running national, cross-disability, grassroots organization run by and for people with disabilities. Founded in 1982, NCIL represents thousands of organizations and individuals including: individuals with disabilities, Centers for Independent Living (CILs), Statewide Independent Living Councils (SILCs), and other organizations that advocate for the human and civil rights of people with disabilities throughout the United States. There are currently over 700 physical locations across America actively providing Independent Living services to people with disabilities. It’s less than one month until the 2018 Midterms. How do you plan to get out the vote? Across the country, advocates like you are writing and implementing GOTV strategies, contacting friends and family to encourage them to show up at the polls on November 6th. You’re using tools and strategies created by your fellow NCIL advocates, such as NCIL’s 2018 GOTV Guide. We need your help to build the disability voting bloc. 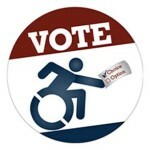 Donate to NCIL’s Voting Rights Fund now, so that more people with disabilities can cast their vote on November 6th. There’s only about a month left until the Midterms, and organizations around the country are gearing up to mobilize their communities to show up at the polls on voting day. Are you ready to Get Out the Vote? Tune in to the following webinars to learn more about voter mobilization and voters with disabilities! On Thursday, October 11th at 2:00 p.m. Eastern, Nonprofit Vote will host the final webinar of their Midterms series on strategies and messaging on GOTV for nonprofits. Attend this webinar to learn how your nonprofit can effectively engage in nonprofit Get Out the Vote tactics to mobilize your community. Sign up for this webinar over at Nonprofit Vote. On Tuesday, October 16th at 2:00 p.m. Eastern, the Great Lakes ADA Center will be hosting “The Right to Vote: Access for People with Disabilities“. During this webinar, Michelle Bishop of the National Disability Rights Network will discuss the status of accessibility of the voting process for people with disabilities. Attendees do have the option of earning 1.5 credit hours of Continuing Education Recognition. On Thursday, October 18th at 1:00 p.m. Eastern, the American Association of People with Disabilities’ REV UP Campaign will host “Breaking Barriers to Voting”. This webinar, which is produced in collaboration with DOnetwork, will discuss navigating polling place barriers for people with disabilities and give attendees an opportunity to ask questions and get answers on their accessibility concerns. Action Alert: Create Your Organization’s Non-Partisan GOTV Plan Today! NCIL is proud to announce the 2018 GOTV (Get Out the Vote) Guide is now available! This newly updated guide now includes information to help organizations and individuals plan and implement a GOTV strategy through phone banking, text banking, and social media. The guide includes information on messaging, best practices, and toolkits available to help you encourage your consumers, members, friends, and family to vote. To view the GOTV Guide and other useful election-related materials, go to www.ncil.org/votingrights. If you have any questions about this guide, please email NCIL Disability Vote Organizer Sarah Blahovec at sarah@ncil.org. Happy National Voter Registration Day! Have you registered to vote, or checked to make sure that your voter registration is current and active? If you’re a person with a disability, it may be more difficult to check your voter registration than it is for non-disabled voters. Reports have shown that most states’ online voter registration systems are inaccessible. Around the country, advocates like you are educating their election officials about the importance of making all parts of the voting process, including registration, accessible to voters with disabilities. But we still have so much work to do, and we need YOUR help to accomplish it. Register to vote today, and then donate to NCIL’s Voting Rights Fund to ensure we can continue this important work through the midterm elections and beyond. Are you ready to engage in voting rights advocacy for the disability community? The American Association of People with Disabilities’ REV UP (Register, Educate, Vote! Use Your Power) Campaign, in partnership with Disability Organizing Network, is hosting a series of free webinars on election accessibility this fall. On September 21 at 2:00 p.m. Eastern, AAPD and DOnetwork will be hosting Access Barriers to Voter Education Materials. “The webinar will explore how political campaigns, hosts of candidate forums, and election officials can make their materials and information more accessible to people with disabilities. Webinar presenters include the National Council on Independent Living and the Center for Disability Empowerment.” You can register for this webinar at the DOnetwork website. Stay tuned as other webinars and events are posted, including the next webinar in the series, which will be held in mid-October.